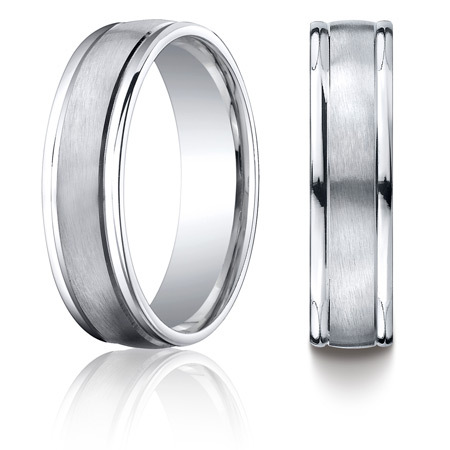 Cobalt chrome wedding band has a satin flat center with polished, rounded edges. Width: 6mm. Thickness: 1.8mm. Comfort fit. Cobalt Chrome is a unique alloy blend that consists of cobalt and other substances to form a bright white alternative metal. It is as white as platinum, hypoallergenic, unbreakable, and scratch resistant. These bands are light-weight, inside round comfort fit and very comfortable to wear. This metal has been used in medical applications for years. Occasional polishing may be required. Manufacturer reserves the right to deny the Lifetime Guarantee for any ring that shows signs of abuse or tampering.